I bet you know the saying “If it weren’t for the last minute, nothing would get done.” Some of us resemble that remark, right? In case you’re one of those people, here are over 25 last-minute gluten-free food gifts for Christmas—all desserts! Find your faves and your gift recipients’ faves and get busy! Oh, and I’ve included some packaging ideas for you, too. 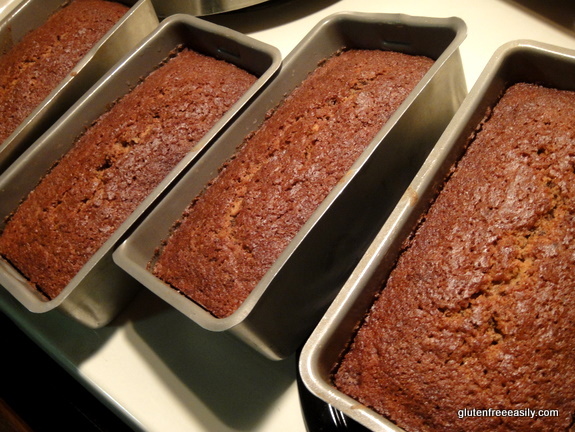 Amish Friendship Bread from Lynn’s Kitchen Adventures ~ Quick breads are such a classic holiday gift and this “no-starter required” version of the classic friendship bread is truly a quick bread. Simple to wrap with plastic wrap, foil, or parchment and tie with a ribbon and attach a gift tag. Bundt Cakes ~ Choose your favorite—or better yet, your recipient’s favorite—from this roundup of over 50 recipes and you’ll have a very, very welcome gift! 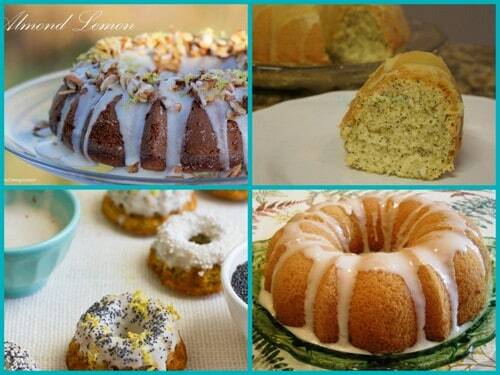 Don’t feel like you have to give a whole Bundt cake to one person or family (unless it’s a large family). A friend gave us half of a Bundt cake once and I was so grateful. I’d never seen that done, but it really was a perfect amount with all the other Christmas goodies on hand and, to be honest, I also sort of loved the crescent moon shape, too. If your Bundt cake turns out pretty, be sure to use clear wrap; if not, simple foil wrapping with curly ribbon is always nice. 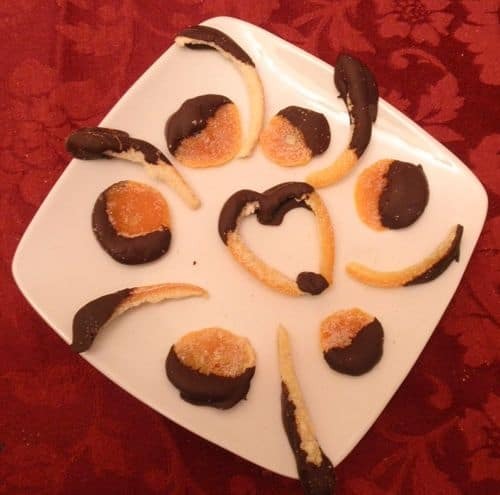 Candied Orange Peel from Gluten Free Goodness ~ The orange and chocolate combination is a pretty sensational one. I love Cheryl’s pretty presentation shown here. Arrange and cover with wax paper or other wrap and delight someone on your gift list. Chocolate Caramel Pretzel Bark from My Gluten-Free Kitchen ~ Nothing says the holidays quite like chocolate bark. 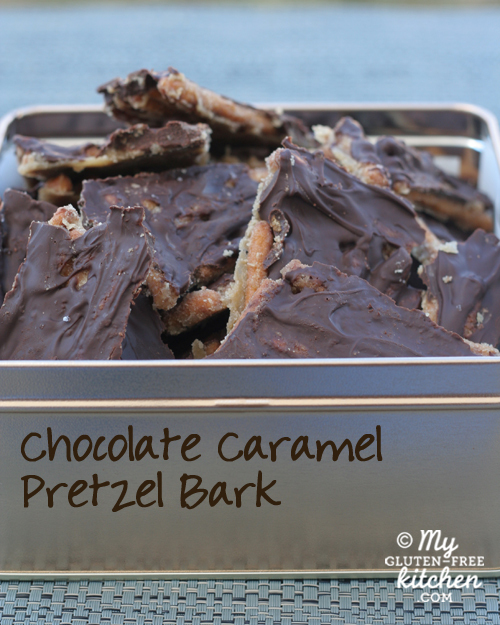 Add in caramel and pretzels and you have a chocolate salted caramel confection with some crunch! Shown in a gift tin, which really is the perfect package. 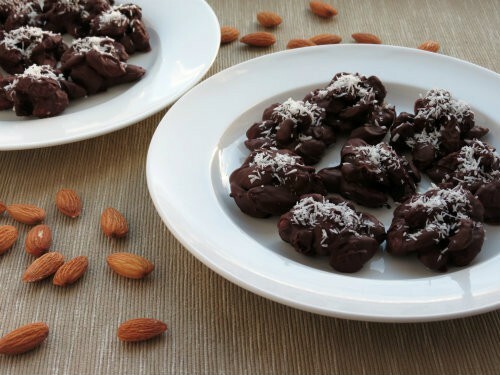 Chocolate-Covered Almonds from Gluten-Free Homemaker ~ Almonds, cherries, chocolate chips, coconut, and sea salt are the ingredients in these Chocolate-Covered Almond Clusters. An easy-to-make-gift that will make your recipients feel very special. There’s really no wrong way to present these delicious treats, but a tall glass (covered with wrapping) or an old-fashioned glass canister would certainly showcase their goodness! 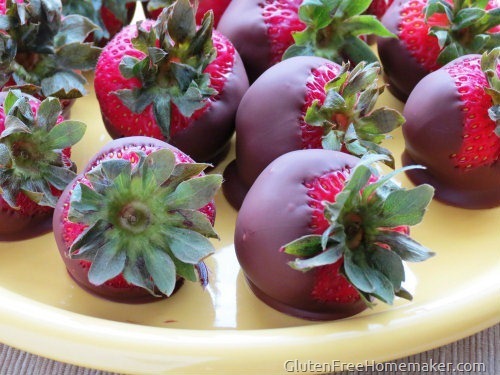 Chocolate-Covered Strawberries from Gluten-Free Homemaker ~ So simple to make, yet so good. You might even be able to repurpose the container the strawberries originally came in as your gift package. Slap on a nice new gift label or big bow and you’re good to go! 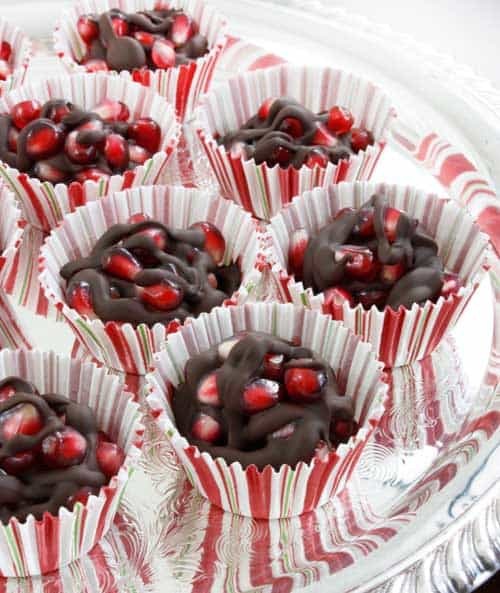 Chocolate Pomegranate Clusters from Flo and Grace ~ These treats will both impress your female friends and delight your male friends who just might call them “bugs” as Lexie’s “boys” do. When presented in wrappers like these, any other packaging only needs to be minimal. 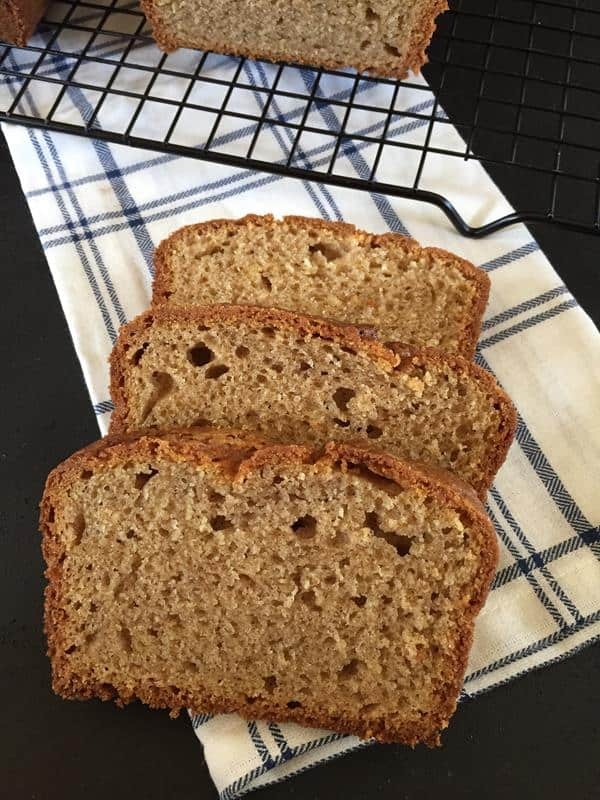 Classic Pumpkin Bread from Gluten Free Easily ~ My sister and I have been giving pumpkin bread for years and it’s always well received. There are so many ways to present it as a gift. Its goodness speaks for itself, so you don’t want to hide that too much! 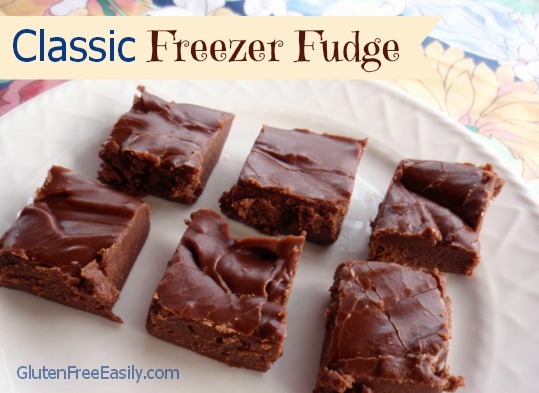 Classic Freezer Fudge from Gluten Free Easily ~ No candy thermometer needed. This recipe goes from bowl to microwave to dish to freezer to your gift container. 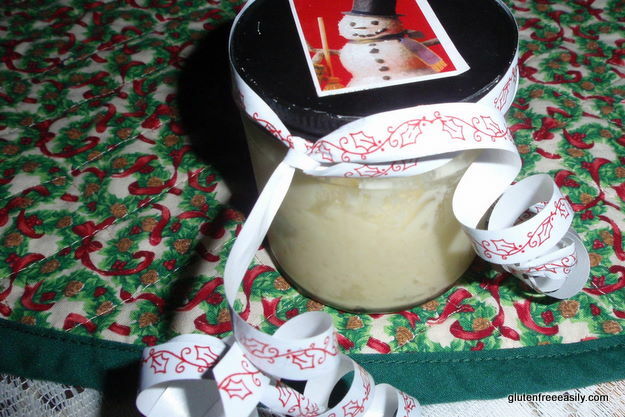 A re-purposed glass jar (I’m partial to salsa jars that have wide mouths) topped with a bow and stick-on gift label or a Chinese take-out box is really all you need to gift this candy. 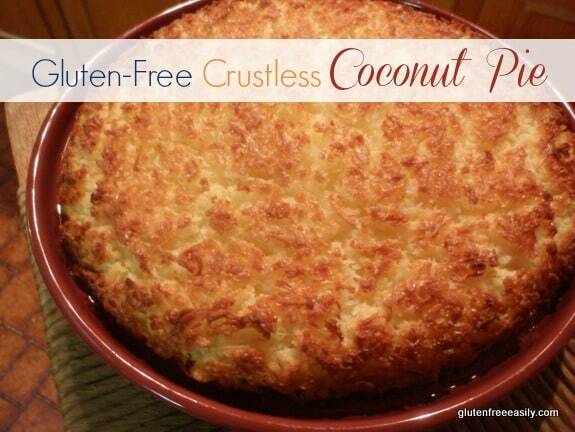 Crustless Coconut Pie from Gluten Free Easily ~ Sometimes the best gift you can give to someone is their very favorite pie (or cake). This pie was on my nephew’s Christmas list not that long ago. I was happy to honor his request and he was even happier to receive it. I simply placed it in a regular gift bag to keep its identity a secret until the very last minute. If coconut is not the flavor, be sure to check out all the other pies and tarts on gfe. 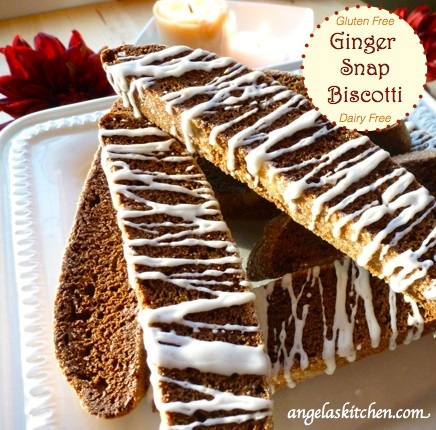 Ginger Snap Biscotti from Angela’s Kitchen ~ Your tea-, coffee-, and milk-drinking family and friends will love receiving the Italian form of a cookie with this beloved holiday flavoring. Brown paper lunch bags with a simple holiday gift label are all you need to share these treats. Fold over the top of the bag; use a hole punch to create a hole on either side; run ribbon through the holes and tie into a bow to make a pretty, sealed package. Gluhwein, German Mulled Wine Kit with Printable from In Johnna’s Kitchen ~ If you have someone on your gift list who enjoys hot spiced wine and has dreamed of going to the Christmas markets in Germany (or returning), this kit is sure to please. 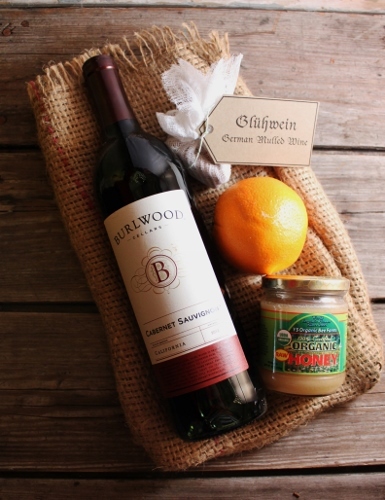 Johnna re-purposes burlap coffee bean bags to bundle her sets, but simple wine gift bags will do the trick, too. And she even shares a lovely printable label with you! Honey Butter from Gluten Free Easily ~ Two ingredients—honey and butter—are all it takes to create this spread that is the secret to the “craved for” rolls and bread at many restaurants. I like to recycle small jars for this gift, but small canning jars work here, too. 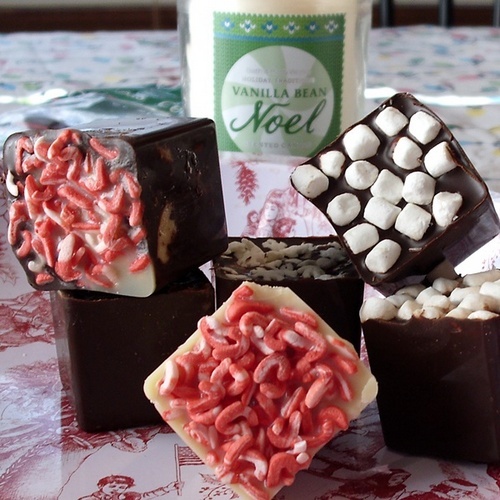 Hot Chocolate Cubes (Dark and White) from Go Dairy Free ~ These creations will have everyone suddenly wanting hot chocolate, which is always pretty special! A stack or square of these would be a lovely presentation … just wrap in clear wrap and a ribbon. Or use them to fill a large mug for a more complete gift package! Maple Caramel Candy Chews from Gluten Free Easily ~ These delicious treats can provide decadent goodness with only healthy ingredients. Make an assortment using various coatings or choose your recipient’s favorite coating (cocoa powder, shredded coconut, etc. to personalize these candies just for them. Use a jewelry box large enough to house a bracelet, line it with tissue paper, and wrap with a ribbon. 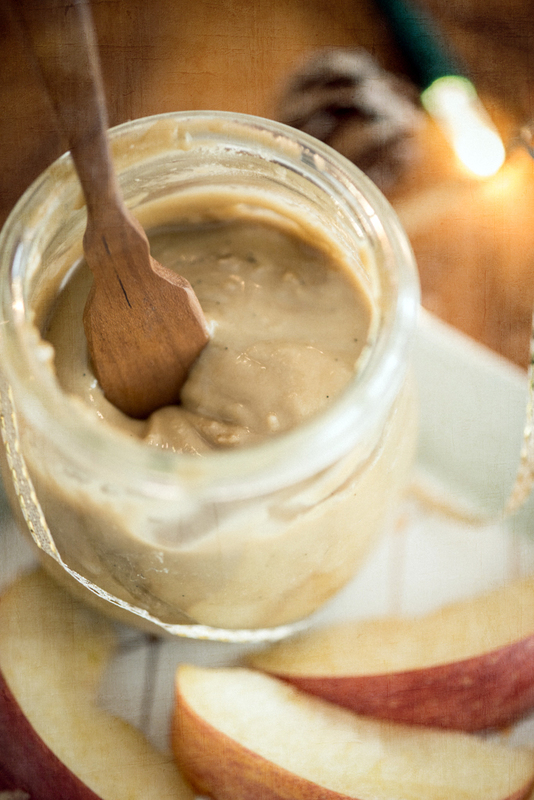 Maple Cream from Jenn Cuisine ~ One ingredient. Yes, one ingredient. Only. Think maple sugar candy in spreadable form! A very small Mason jar is really all you need to share this present. Once the recipient opens it, s/he will feel like they’ve received their own pot of liquid gold! 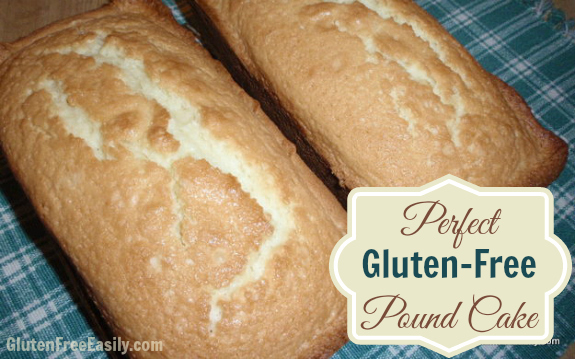 Perfect Pound Cake from Gluten Free Easily ~ One of the most popular recipes on my gfe blog, this cake can be made in two loaf pans or in a single Bundt pan. Don’t worry too much on fancy packaging, but attach the recipe for this one and you will be doubly loved! 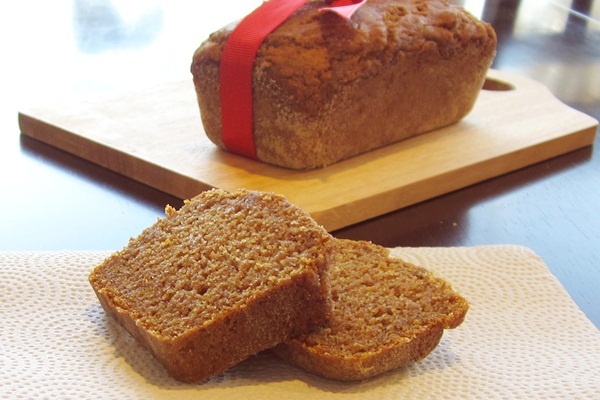 Perfect Pumpkin Bread from Go Dairy Free ~ The simplest of packaging is shown for this recipe. Gifts that come wrapped in a big red bow always seem to be the best! Popcorn Chocolate Candy Christmas Treat from Simply Living Healthy ~ I don’t know anyone who doesn’t look at this creation of Andrea’s without salivating. 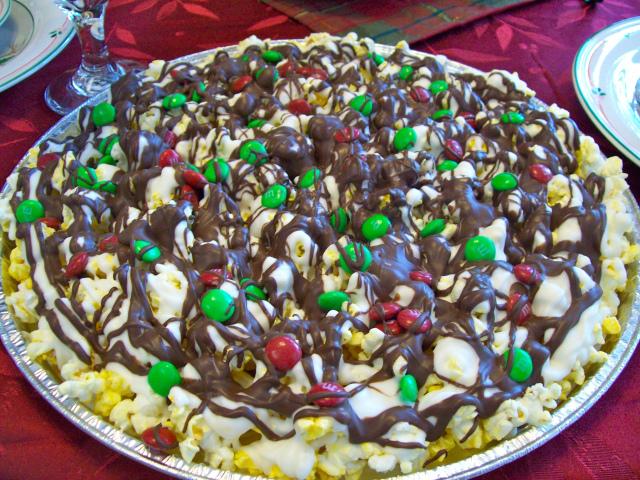 Popcorn, chocolate, and candies assembled on a pizza pan create a gift that is sure to impress! You’ll want to keep the packaging simple for this one. Because this gift treat has its own colorful beauty, plastic wrap will suffice. 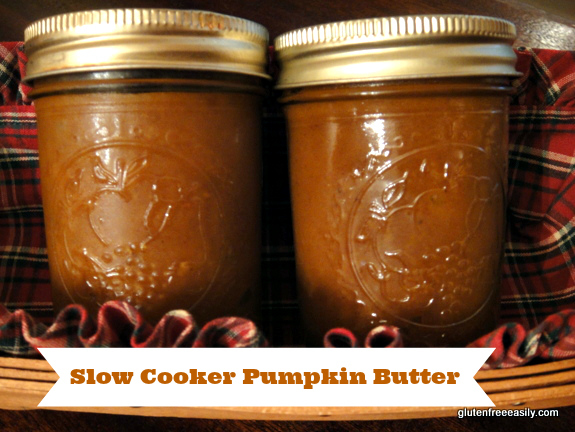 Pumpkin Butter from Gluten Free Easily ~ Because this is a slow cooker recipe, to ensure this is a “last minute” gift, add your ingredients to your slow cooker when you go to bed (or rise early to add them) so that cooking time will be finished before you need to deliver your gifts. I like these 8-ounce quilted jelly jars for sharing my homemade pumpkin butter. A circle of holiday fabric can be placed over the lid before you screw on the ring for an especially festive look. 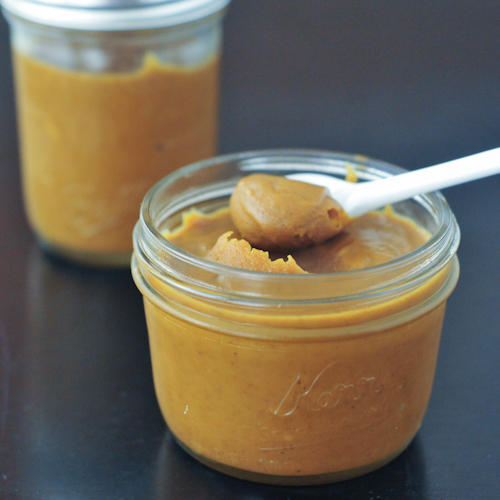 Pumpkin Coconut Caramel Sauce from Spabettie ~ The only thing better than a single, heavenly dessert is a dessert that can turn everything else into a divine dessert. And this sauce can do just that. Add it to toast, coffee, ice cream … whatever you want! The packaging choice is clear. 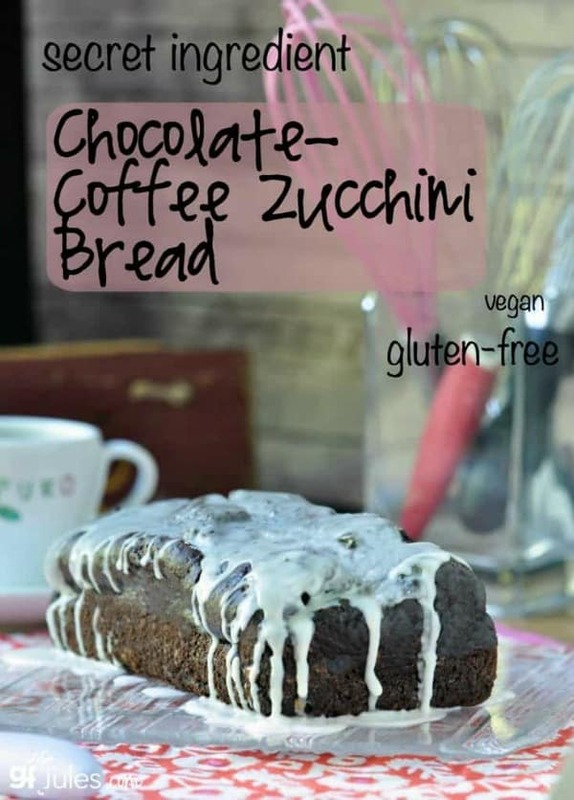 “Secret Ingredient” Chocolate Coffee Zucchini Bread from GF Jules ~ This loaf of bread is a magical combination of three beloved ingredients. Fresh-brewed coffee “amps up the chocolate taste without making it too sweet.” There’s even an easy egg-free, vegan option, if needed. 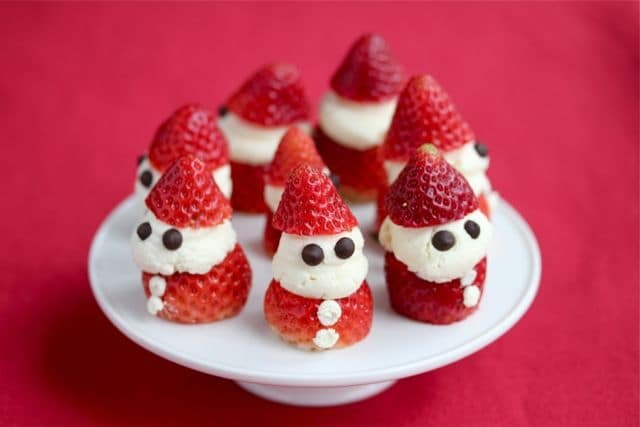 Strawberry Whipped Cream Santas from Jeanette’s Health Living ~ These adorable treats made from strawberries, whipped cream, and chocolate chips hardly take any time to make, but they will surely delight your gift recipients! 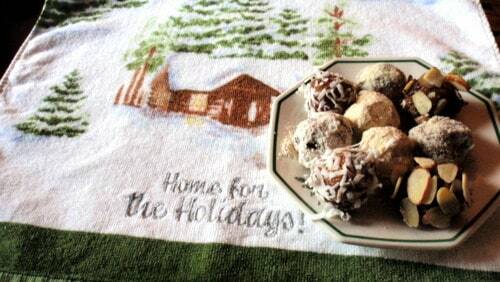 Share on a holiday tray/plate or paper doily-covered plate that you don’t need back. Sugared Cinnamon Almonds from A Year of Slow Cooking ~ While you’re doing last minute prep for entertaining or gift wrapping (in my case, dropping purchases into gift bags—best idea ever! 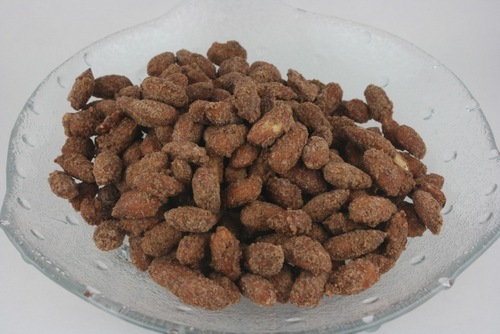 ), let your slow cooker do the work with these candied almonds! Holiday tins or a simple Ziploc bag with a pretty label and curly ribbon (tied through a hole punched in the corner past the zipper part) is all you need to give these treats. 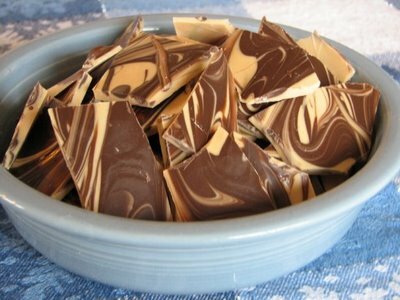 Tiger Bark from Lynn’s Kitchen Adventures ~ Four ingredients and you have this beautiful bark with the fun and descriptive name. “See-through” packaging will instantly show your great work—and how much you care—but a flat tin will make for a more elegant offering! Vanilla Extract from Gluten Free Easily ~ While everyone knows that it can take weeks—even a few months in some cases—to properly “extract” vanilla from vanilla beans using alcohol, what you might not know is that it’s actually really fun to give vanilla extract to someone at the beginning of the process versus waiting until it’s ready to use. 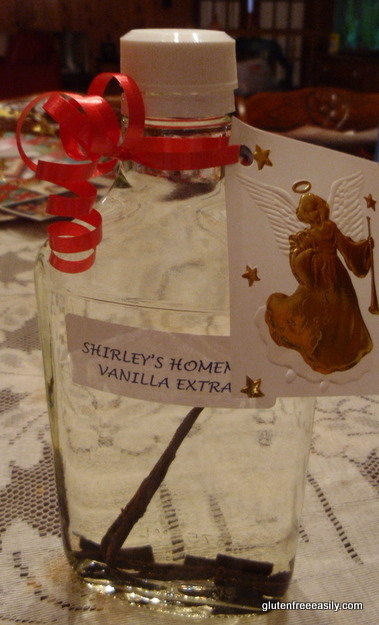 With the vanilla extract being a work in process, they get to shake the jar every other day and check on its progress. It’s sort of like giving someone a really wonderful science project. When the vanilla extract is finally ready, they’ll feel like they were responsible for this heavenly concoction that will help them create divine baked goods. Tie a ribbon around the neck of your bottle and add a gift tag (I like to recycle cut-out figures from Christmas cards); that’s all there is to packaging this food gift! I hope you found some ideas that will make ideal last-minute gluten-free food gifts for your loved ones! If you’re like most of us and not getting together with your family and friends on Christmas Day, these gifts might not even be that last minute. I’m one who likes stretched out celebrations and having extra time is one of the benefits! Merry Christmas to all of you who celebrate this holiday! Originally published December 24, 2013; updated December 23, 2018. This is a great round up, Shirley. Food always makes a good gift. I’ve been making roasted cinnamon almonds in the oven while I do other things. They are so easy and everyone loves them. Thanks for sharing my strawberries and almond clusters. Thank you, Linda. I think that food has become an even more valuable gift for those of us who want less “stuff” in our lives and as a result are appreciating consumable gifts more. And, of course, for those of us with food intolerances receiving safe food gifts is a real joy! Great idea on making the roasted cinnamon almonds in the oven while doing other holiday tasks. As long as one uses one’s timer, that works great. 🙂 Happy to share just two of your great “quick” recipes that work well for gifts! Thank you, Shirley! What a fantastic collection of recipes you put together. I can’t decide which to make first! Merry Christmas! Hi Debbie–It’s good to see you here at All Gluten-Free Desserts! 🙂 And you are welcome, of course. Even after the holidays are over, this is a great list to call upon for ideas. 😉 Thanks so much for the Christmas wishes, dear. Merry Christmas to you, too!